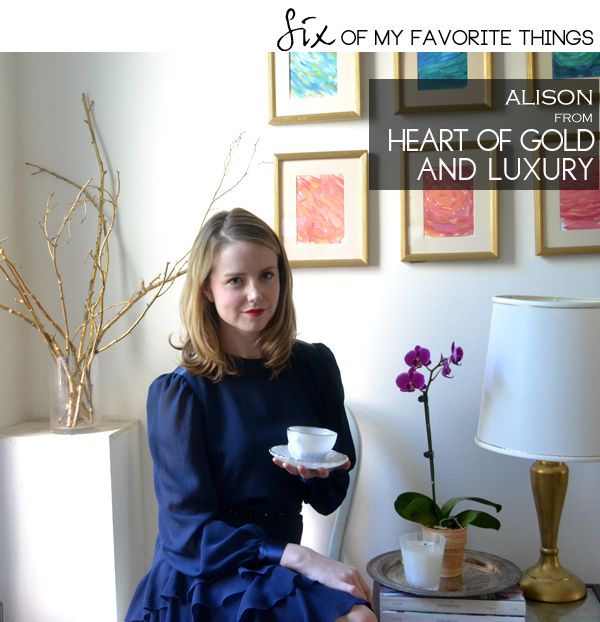 I'm beyond thrilled to introduce you today to Alison from a Heart of Gold and Luxury. 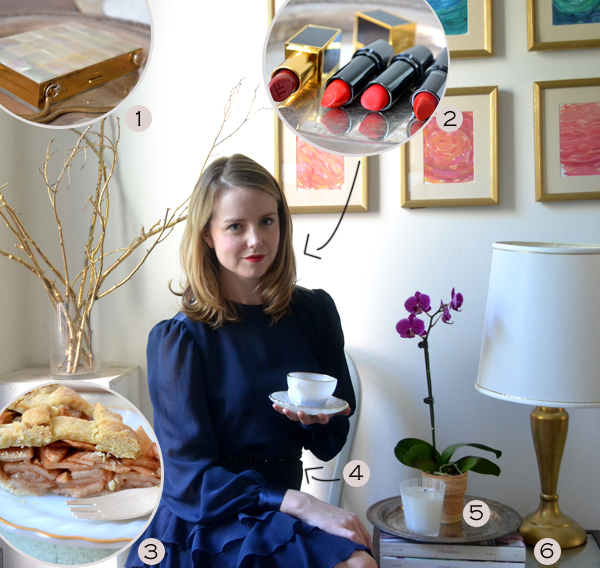 Alison is one of those well rounded bloggers whose style I love. She bakes the most appetizing treats, she takes beautiful photographs, has a wonderful eye for styling, and she has great taste! Here is the lovely Alison presenting to us her Six Favorite Things. (I love a girl who loves wearing red lips and has the same passion for gold that I have). Hello everyone! My name is Alison and I am the editor of Heart and Gold and Luxury, a lifestyle blog dedicated to fashion, food, interiors and just beautiful things. I am so excited and flattered that Albertina asked me to share a few of my favorite things with you. I hope that you enjoy! 1 | My Favorite Color. Gold, gold, gold. I am not exactly sure when my fascination with this gilded hue began but the more gold the better. I find ways to incorporate this color into my life where ever possible, from gold flecks on macarons, china to golden frames. I especially love gold when paired with Mother of Pearl - the result is pure opulence. 2 | My Favorite Lipstick. Red. Nothing quite says femininity like a powerful red lip. I have quite a few lipstick favorites depending on the finish that I am looking for - currently loving Tom Ford and Lancome. 3 | My Favorite Domestic Activity. Baking! I love to cook and bake, but especially prefer the latter. There is nothing like spending time in the kitchen to create something delicious all the while filling your home with an aroma that makes your mouth water. I am constantly looking for new recipes to try. I recently went apple picking and whipped up an apple pie and nothing says fall quite like the mélange of apple pie spices mingling in the air. 4 | My Favorite Shopping Source. Vintage and thrift stores. As much as I love shopping for newness in the City, I actually find more excitement in thriting, especially pieces from the 70’s and 80’s. I purchased this dress that I am wearing a few years back at Beacon’s Closet in Brooklyn for $15. I absolutely adore the deep navy color and the layers of ruffles. Also, I purchased the six frames from a thrift store, before they were ugly white plastic ribbed frames, I just sprayed them with one coat of gold spray paint and presto beautiful frames. 5 | My Favorite Things. Flowers and fragrance. Although I have many passions in life, flowers and things that smell good seem to make me the happiest. I love all flowers, but currently trying to perfect my knack for growing orchids. I also adore roses and peonies for their romantic layers. In addition, I also enjoy fragrant candles laced with white florals - especially gardenia, tuberose and jasmine. My favorite candle brand is Voluspa. 6 | My Favorite Collecting Hobby. Magazines. Some might say I have hoarding tendencies when it comes down to it, but my argument is that my collection of Vogue and Bazaar serve as a major source of inspiration. Thanks Alison for sharing your favorites with us. I would really love to meet this multifaceted and talented lady. Visit Alison's blog so you can see why I love stopping by there every morning. You will become a fan like me, I promise! How lovely is her art?!?! So gorg! Well, I'm a fan of anyone who can wear red lipstick with such panache! And that ruffled dress is something fab. Happy to have discovered this blogger this morning. And happy Thursday lady! Hope it's been a fab week for thee. Wow! You are beautiful and have great taste!! Love her "loves". And I agree, mother and pearl and gold does sound opulent! Very stylish! Totally agree with your love for vintage and thrift stores! Loved meeting her Albertina. Thanks for passing this beauty around. I love that pearl and gold clutch!!!!! Im loving all things gold currently. Im going to go cut some branches and spray paint them pronto! I need that dress!! So stylish! lovely post! Super cute. I'm headed over there now! Love gold lately as well! Love her style! This is a great series. How fun! I am always a little jealous of ladies who can wear red lipstick so well!!! Ok, she is the cutest thing I have seen all day. Love her favorite things.